More than 300 Los Angeles Police Department officers and family members packed a City Council meeting Tuesday to demand across-the-board pay increases, warning the department will lose officers if one isn't provided. Nearly a month after officers rejected a one-year contract offer, officials with the Police Protective League told the Los Angeles Times the LAPD's starting salary has fallen behind pay for officers in at least 13 other Southern California law enforcement agencies. 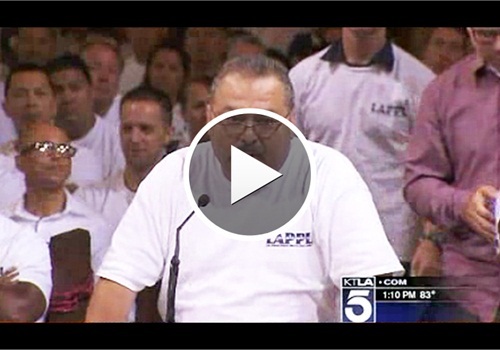 LAPD officers have already begun heading to other departments, union leaders told the council. "Our officers are not without alternatives," said league President Tyler Izen, whose union represents around 9,900 officers. "Experienced and well-trained officers are desired by police and sheriff's departments throughout Southern California." Mayor Eric Garcetti and council members have been trying to hold the line on raises across the city workforce as part of a larger strategy to limit the growth of pension costs and erase a spending deficit by 2018. The city budget's yearly contribution for the retirement benefits of police and firefighters is expected to quadruple to $710 million in 2016 from $175 million in 2005, according to a report submitted to the council in April. Each increase consumes money that could be used to pay for basic services. The contract rejected by officers three weeks ago would have hiked the pay of nearly 1,000 officers who were hired since 2009 with a salary 20% lower than their counterparts. The deal also would have increased the amount of cash overtime paid to officers this year to $70 million, up from $15 million last year. And it would have boosted the starting salary of officers to $57,420 a year from $49,924. Even with that increase, starting pay would remain below pay at police agencies in Santa Monica, Simi Valley and other cities, according to league officials.